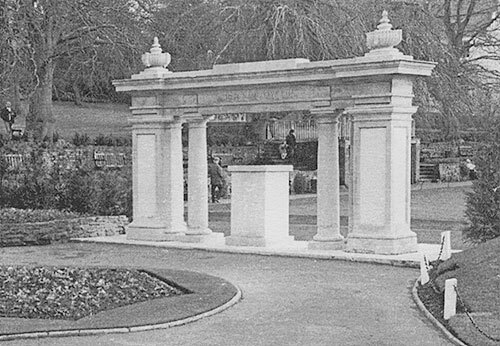 After the First World War a Memorial Arch was erected in the Castle Grounds, Guildford. It was unveiled on Sunday, 6th November 1921 by Lieutenant General Sir Edmund Elles, KCB, Deputy Lieutenant of Surrey and Chairman of the Territorial Force Association. It was dedicated by the Bishop of Winchester. Following the Second World War nothing more was done than adding the dates to the entablature of the existing Memorial. Gradually it became assumed that the carved names recorded the fallen of both wars, though close inspection would have revealed that could not be. As the fiftieth anniversary of the defeat of the Axis powers approached, the wish was expressed that a Memorial for the Second World War should be set up, inscribed with the names of those who had died. After so long an interval, gathering the names was not easy, but every effort was made to compile a complete list, restricted to those whose homes were in the Municipal Borough as it was in 1945. Names were submitted by families and friends, and some churches and schools have rolls of honour. Considerable assistance was given by the Commonwealth War Graves Commission. The addition to the Memorial built of Portland stone was designed jointly by Haven Memorials of Crookham Village, Fleet, Hampshire and officers of the Parks and Open Spaces Section of Guildford Borough Council. The lettering was cut by Andrew Holmes of Haven Memorials. It was unveiled by the Mayor of Guildford, Councillor Mrs Catherine Cobley, on 5th November 1995 and dedicated by Bishop Hugh Montefiore. 660247 – Private V C Blanchard, The Queen’s Royal Regiment (West Surrey). Killed in action in North Europe, 26th September 1944, Aged 25. 95638 – Captain M A T Burke, The Queen’s Royal Regiment (West Surrey). Killed in action in North Africa, 6th May 1943, Aged 23. 65641 – Captain J S Chaldecott, The Queen’s Royal Regiment (West Surrey)1/5th Battalion. Died in a training accident in England, 1st August 1941, Aged 25. 6102519 – Private C Clarke, The Queen’s Royal Regiment (West Surrey) 5th Battalion. Died as a prisoner of war in Germany after an accident in a coalmine, 1st May 1945, Aged 24. 88533 – Captain (QM) E P Collins, The Queen’s Royal Regiment (West Surrey), 2/5th Battalion. Killed in action in the Central Mediterranean area, 3rd September 1944, Aged 45. 772805 – Corporal S W Dubery, The Queen’s Royal Regiment (West Surrey) attached to the Auxiliary Military Pioneer Corps. Lost in SS Lancastria in the evacuation of Dunkirk, 17th June 1940, Aged 30. 14218903 – Private R F Dyer, The Queen’s Royal Regiment (West Surrey) 1/5th Battalion. Died of wounds received in Italy, 5th December 1944, Aged 19. 6092231 – Lance Sergeant J Edwards, The Queen’s Royal Regiment (West Surrey) 1/5th Battalion. Killed in action in France 16th June 1944, Aged 25. 239633 – Lieutenant Quartermaster F G Fower, The Queen’s Royal Regiment (West Surrey) attached to the Green Howards. Killed in action at sea, May 1942, Aged 36. 6090292 – Private H E Furlonger, The Queen’s Royal Regiment (West Surrey) 1/5th Battalion. Died as a prisoner of war in Italy, 17th December 1942, Aged 23. 6086179 – Colour Sergeant G P C Girdler, The Queen’s Royal Regiment (West Surrey) 1st Battalion. Killed in action in North Africa, 3rd December 1942, Aged 25. 6098142 – Private W C Gittings, The Queen’s Royal Regiment (West Surrey) 2nd Battalion. Killed in action in Burma, 4th April 1944, Aged 28. 6091681 – Lance Sergeant N J Halsey, The Queen’s Royal Regiment (West Surrey) 2/5th Battalion. Killed in action in Italy, 3rd September 1944. 6073095 – Private C B Hardwick, The Queen’s Royal Regiment (West Surrey) 1/5th Battalion. Killed in action in France, 9th August 1944, Aged 25. 6094435 – Lance Corporal A V Harvey, The Queen’s Royal Regiment (West Surrey) 1/5th Battalion. Died of wounds in France 17th August 1944, Aged 27. 5507982 – Private W G Hill, East Surrey Regiment 1/6th Battalion. Killed in action in the Central Mediterranean, 1st November 1944, Aged 35. 92323 – Second Lieutenant R L Hopkins, The Queen’s Royal Regiment (West Surrey) 1/5th Battalion. Killed in action 29th May 1940, Aged 26. 6194429 – Sergeant Major H F Newman, The Queen’s Royal Regiment (West Surrey) 1/5th Battalion. Killed in action in France, 29th May 1940, Aged 27. 120556 – Captain R A B O’Neill-Hobson, Croix de Guerre, The Queen’s Royal Regiment (West Surrey) attached to the Burma Rifles 9th Battalion. Killed in action in Asia, 18th June 1942, Aged 41. 6098976 – Private F G Parsons, The Queen’s Royal Regiment (West Surrey) 1/5th Battalion. Presumed drowned when a prisoner of war ship was sunk in the Meditteranean Sea, October or November 1942, Aged 30. 5439231 – Private A R Piggott, East Surrey Regiment 1/6th Battalion. Killed in action in Italy, 13th May 1944, Aged 25. 134061 – Captain J A Pryce, The Queen’s Royal Regiment (West Surrey). Died in India, 12th August 1945, Aged 27. 197059 – Second Lieutenant F W C Pullen, The Queen’s Royal Regiment (West Surrey). Died in India 20th July 1942, Aged 23. 134111 – Lieutenant F E Ramsay, The Queen’s Royal Regiment (West Surrey) 30th Battalion. Died in England 17th June 1943, Aged 36. 6087866 – Private A G S Searle, The Queen’s Royal Regiment (West Surrey) 1/5th Battalion. Died of wounds in North Africa, 1st May 1943, Aged 21. 6088619 – Corporal W A Spaul, The Queen’s Royal Regiment (West Surrey) serving with 2 Commando. Killed in action in France, 28th March 1942, Aged 21. 6087861 – Private R N Tee, The Queen’s Royal Regiment (West Surrey) attached to 6th Bn The Queen’s Own Royal West Kent Regiment. Killed in action in Italy, 25th June 1944, Aged 20. 6477797 – Private D C J Waters, the Queen’s Royal Regiment (West Surrey) 2/6th Battalion. Died of wounds in Italy 15th March 1944. 6090364 – Private A Webster, The Queen’s Royal Regiment (West Surrey). Killed in action in Italy 1944, Aged 23. 6097074 – Private S H Wilson, The Queen’s Royal Regiment (West Surrey). Killed in action in Burma, 6th June 1945. Aged 30.